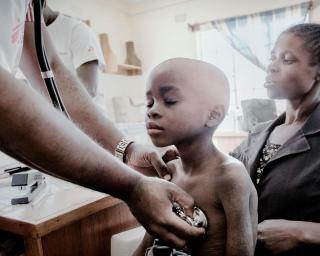 As the annual global HIV/AIDS conference kicks off this week in Amsterdam, the international medical humanitarian organization Doctors Without Borders/Médecins Sans Frontières (MSF) called out ViiV Healthcare—a division of US-based pharmaceutical corporation Pfizer, UK-based GlaxoSmithKline, and Japan-based Shionogi—for preventing children with HIV from getting child-appropriate versions of a critical HIV medicine called dolutegravir. While the World Health Organization (WHO) now recommends dolutegravir as a preferred treatment option for adults and for children from four weeks to 10 years of age, ViiV has failed to register the pediatric formulations in many places where it is most needed. Additionally, Viiv is pricing the pediatric formulations much higher than the adult formulations, and has not yet finished the development of a dispersible version for babies and the youngest children. These barriers force HIV-positive children to rely on pediatric treatments containing suboptimal drugs with more side effects. Children need access to the best and most robust medicines possible when starting treatment—medicines that are less likely than others to stop working by becoming resistant—given that they will likely take HIV medicines for life. Despite ViiV pledging last November that it would expedite availability of pediatric dolutegravir formulations where they are most critically needed—and despite repeated appeals from MSF and others—the corporation has started the registration process in only three sub-Saharan African countries: Kenya, Nigeria, and South Africa. This leaves the majority of children in developing countries without access. In situations where medicines like this are needed but not yet registered, they are often imported using import waivers. However, ViiV claims it is against their policy to do so even if governments are prepared to issue such waivers. MSF is also calling on ViiV to urgently finish the development of a new dispersible version of dolutegravir for babies and the youngest children with HIV, which is not available anywhere, and complete dosing studies in children that are needed to further optimize and simplify treatment for kids. They must also honor their commitment to supply the pediatric formulations as needed while generic versions are being developed, including through their recently announced collaboration with Unitaid and the Clinton Health Access Initiative, as this development will take at least several years. The price of pediatric formulations of dolutegravir is also problematic; ViiV sells the adult 50mg dose for approximately $223 per person per year, but charges $214 for the 25mg and $115 for the 10mg pediatric formulations. If a child needs a dose of 35mg, ViiV would charge $329 per year, more than $100 higher than adults pay—and this does not include the two other drugs required to make up the full treatment combination. Generic versions of an adult triple-drug cocktail containing dolutegravir cost as little as $75 per person per year.